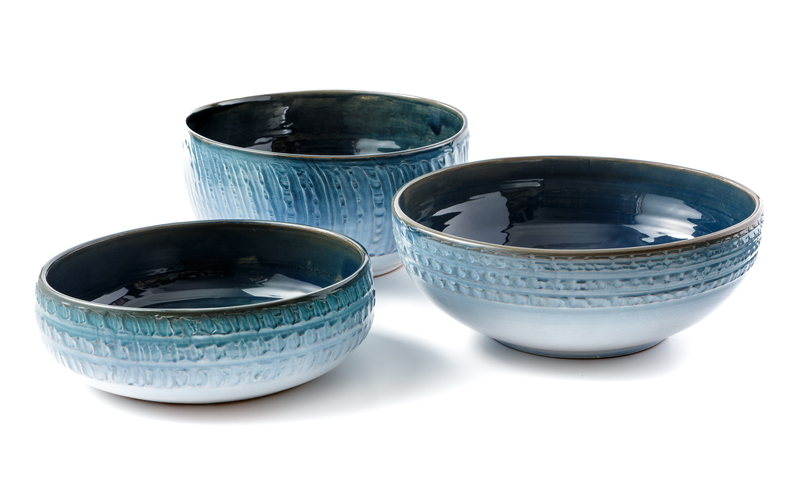 These lathe-shaped bowls of various shapes with vibrant crystal decorations are evocative of water, the central theme of this craftswoman’s distinctive line Abba. 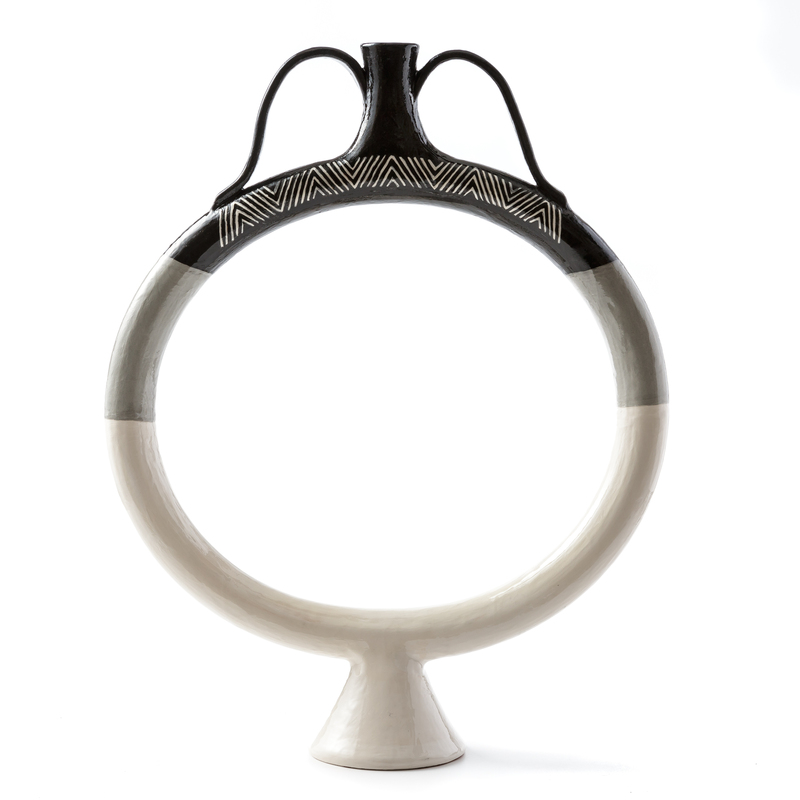 The prized and archaic form of the ring-shaped amphora is revisited with minimal and contemporary lines in white, grey, and black graphics. 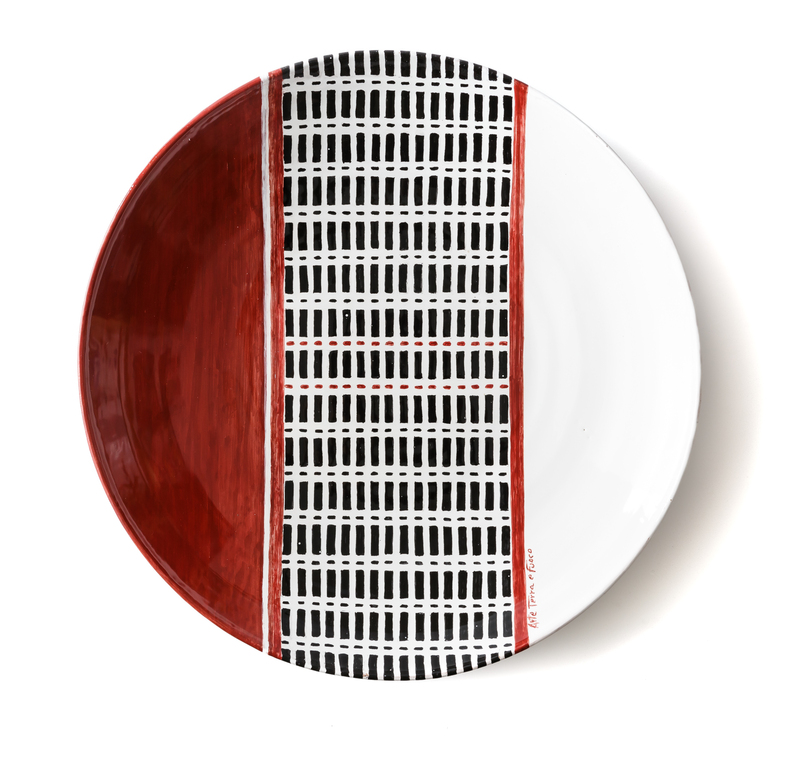 These lathe-shaped ceramic plates are decorated with graphic motifs that evoke, in balanced compositions, the typical fabric of the traditional saddlebags. These large lathe-shaped glazed ceramic receptacles feature striking material decorations, inspired by the theme of water and its crystal-clear movements. 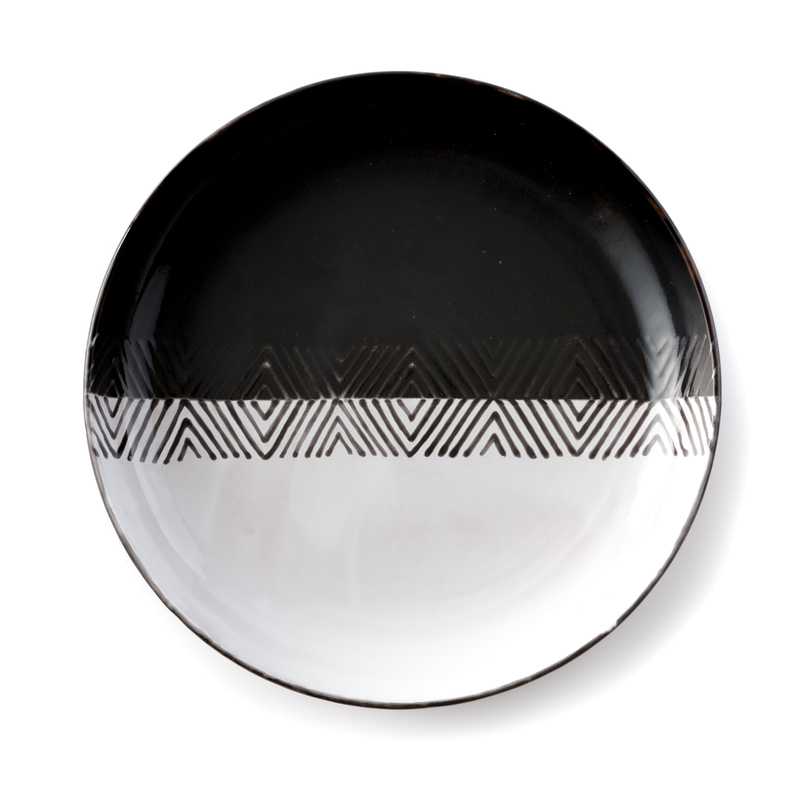 These glazed ceramic plates with delicate white, black and grey graphic decorations have the solid shape and structure of lathe-shaped pottery. They are part of the Cotto Orbace line characterised by delicate clear-cut lines, reminiscences of loom-woven fabrics typical of the local tradition. 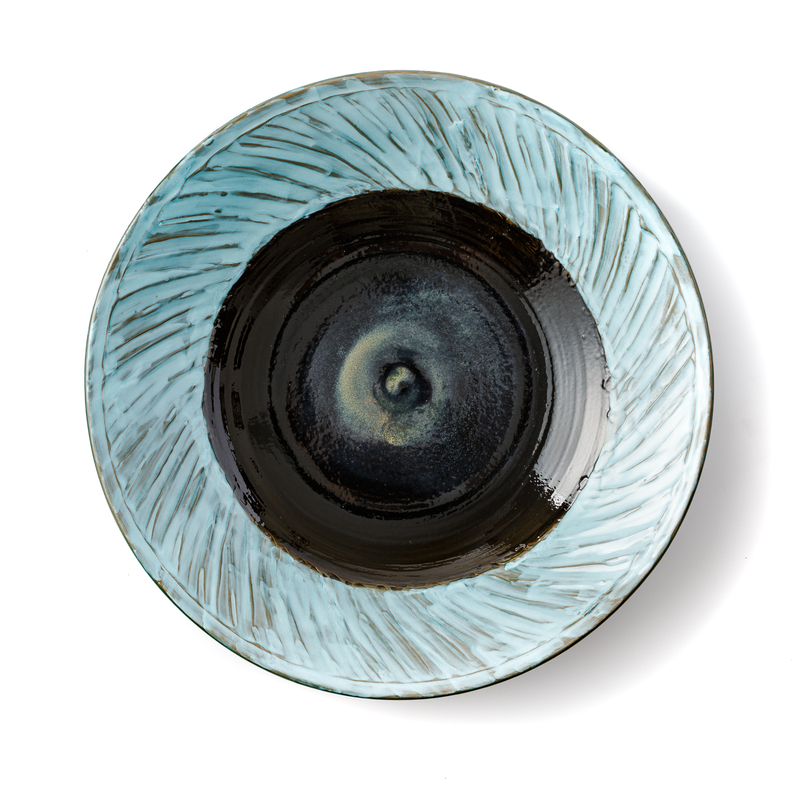 Arte, Terra e Fuoco ceramics by Patrizia Cara reveal a thorough creative process stemming from her heart-felt research that is rooted in the nature and tradition of the island. Strongly motivated, she studied pottery out of passion, sure that she would find her own expressive medium there. Self-teaching and apprenticeship contributed to maintaining her personal style. She is fascinated by the tradition of this ancient craft aimed at creating functional objects that she uses to express a sensitive decorative taste with an elegant aesthetic value. In her workshop in Guspini, in the South of Sardinia, Patrizia creates decorative and functional home décor items which recount memories of the island’s archaic tradition by using raw materials, elaborate glazed colours and graphic textures inspired by loom-woven fabrics. She promotes her prestigious creations participating in the main regional exhibitions dedicated to excellences of the local crafts. The production includes a rich variety of home décor accessories grouped in product lines and composed of elements of various shape and function, which are complemented by a varied production of custom made items to meet her clientele’s every need. The Abba and Arcuentu collections testify this craftswoman’s stylistic path, revising inspirations and reminders of Sardinia and its landscapes through the use of raw materials and vibrant colours, whilst the Cotto Orbace line revises, by means of elegant graphic designs and neat traits, the traditional loom techniques. All the collections include a number of coordinated pieces ranging from the centrepiece container to the lamp, up to the gay collection of decorative elements and small animals. Lathe-shaping, plate-shaping and manual shaping are the techniques Patrizia uses with great technical expertise. Decorations are engraved, enamelled or glazed and enriched with engravings or perforations.